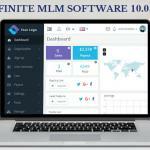 We are pleased to announce new features and enhancements to the Infinite MLM Software version 10.0. Great acceptance and success of our previous versions drive us to version 10.0 with modern technology. Check out our latest version with advanced and exciting features.